Dr Arundel is a Senior Research Fellow with the Healthy Liveable Cities Group at RMIT University. He has 15 years of experience in the telecommunications and transportation industries. Over this time he has worked as a consultant, analyst and manager of technical teams. His background spans Agent-Based Modelling, remote sensing and ecology and he has a strong background in spatial methods including GIS. 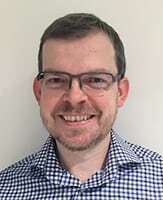 He is currently leading the development of a national liveability indicator geospatial database and portal that will allow users to visualise the indicators developed in the Australian National Liveability Study and allow researchers to securely link population health survey data to these indicators. At first glance, Jonathan Arundel’s career progression seems unusual. He’s worked in telecommunications, studied bees in rural Victoria, helped improve public transport and is now researching urban liveability. Since early 2017, Dr Arundel has been a Senior Research Fellow at RMIT’s Centre for Urban Research. As part of the Prevention Centre’s Australian National Liveability Study, he’s helping develop a geospatial database and online portal called the Urban Observatory which will provide indicators of liveability within and across Australian cities. The Observatory will help disseminate the findings from the Liveability Study. The first of its kind, the study explored how indicators of liveability, such as walkability, transport, public open space and the availability of food and alcohol, are associated with health and wellbeing in Australian capital cities. Dr Arundel trained as an electrical engineer and worked in telecommunications, but changed tack during his PhD. His research led him to collaborate with a geneticist investigating feral honey bee colony densities throughout Victoria, in both natural and disturbed environments. Then he moved into analytics at Public Transport Victoria. His team was responsible for analysing the electronic ticketing transactions of half a billion trips made each year on Victoria’s public transport network to work out who was using those services, where, when and why, and provide information to planners to improve future public transport. Now working with the Prevention Centre, Dr Arundel lives right in the centre of the city and just a short walk from RMIT University. 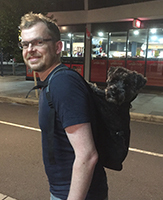 He still gets plenty of walking done with his miniature schnauzer McNulty. McNulty doesn’t care much for the rain though, so he’s got a special backpack so he can also use Melbourne’s trams.